Pyrroindomycins are spirotetramate natural products characteristic of a pentacyclic core, which contains two cyclohexene units present in both the trans-decalin system and the tetramate spiro-conjugate portion. LIU et al. previously demonstrated that the formation of this highly rigidified, enantiomerically pure pentacyclic core relies on the cross-bridging of a linear polyene intermediate through two enzyme-dependent, Diels-Alder-like [4+2] cycloaddition reactions that proceed in tandem (Nat. Chem. Biol., 2015, 11, 259-265; Cell Chem. Biol., 2016, 23, 352-360; Curr. Opin. Chem. Biol., 2016, 31, 95-102). Here, LIU and PAN et al. provide structural and mechanistic insights into PyrE3, an endo-selective [4+2] flavocyclase that catalyzes trans-decalin formation in the biosynthesis of pyrroindomycins (Cell Chem. Biol., 2018, DOI: 10.1016/j.chembiol.2018.03.007). The flavin cofactor plays an essential structural role in PyrE3, where it is amenable to redox change; however, redox change has little effect on the [4+2] cyclization activity of the protein. PyrE3 appears to selectively accommodate the related 1,3-diene and dienophile groups in a highly positively-charged pocket, and can accelerate trans-decalin formation likely through an endo-selective [4+2] transition state. Flavin-dependent enzymes are ubiquitous and participate in numerous redox reactions that occur in all domains of life. 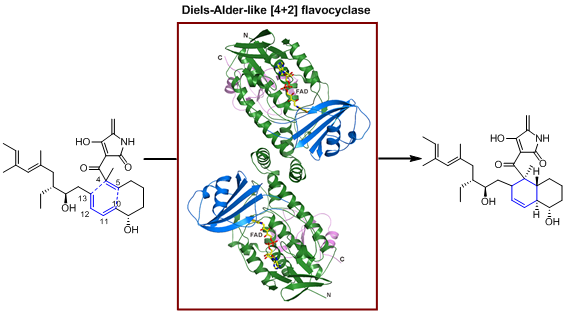 The functions of these flavoenzymes typically rely on the redox change of the flavin cofactor. PyrE3 is a flavocyclase that does not require flavin redox change during the process of catalyzing an endo-selective Diels-Alder-like [4+2] cycloaddition. Its non-covalently bound flavin cofactor plays an essential structural role in catalysis, to maintain the requisite geometry of the protein and position the 1,3-diene and dienophile groups through specific interactions with the substrate. The findings in this study generate interests regarding the versatile functions of flavoproteins, particularly those requiring no flavin redox change. This work was supported in part by grants from the Chinese Academy of Sciences (CAS), the National Natural Science Foundation (NNSF), the Ministry of Science and Technology (MST), and the Shanghai Science and Technology Committee (STCSM) of China.